In this class there are five different styles of arm bikes, all of which can also be used as leg pedal exercisers. There are auxiliary parts that you can attach for your hands available for some models. All the arm exercisers on this page will help you to tone and strengthen your arms, allow for movement in your shoulders and back, as well as burn calories while still seated at your desk. 1. The first is a very simplistic arm pedal exerciser, no added bells and whistles other than a simple tension knob. 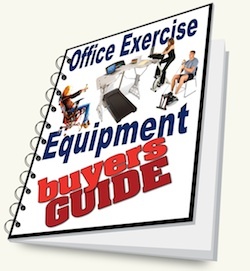 To use under your desk on while seated, just place on the floor in front of you and pedal. 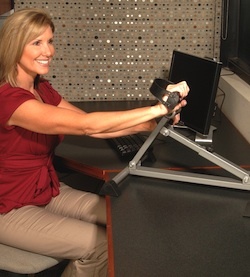 For your arms, put on the top of your desk and pedal by putting your hands in the foot stirrups. This machine works in both directions. Low impact and will get your blood pumping for circulation and improve metabolism. 2. Next on the list is the Adjustable Height Cycle – Great for use as a foot pedals as well as for arms. The adjustable height feature will allow you more comfort on either the desk or the floor. By adjusting the height you can help ensure the exercise you are doing won’t strain your shoulders in an awkward plane. An additional benefit is it also has a tension adjustment so you can choose how difficult you want your workout to be. Allowing for full range of motion and both forward and backward pedal direction to ensure you get an overall arm workout. 3. 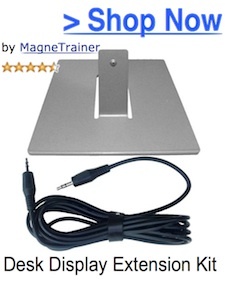 The MagneTrainer by the majority of people who have purchased and use it. 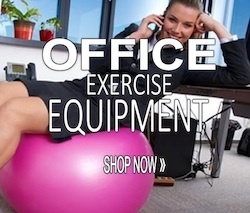 It can be used on the floor an under your desk, or on your desk as an arm exerciser. This one is a little heavier than the first two and is rated as commercial grade. With its own display monitor and non-slip grips on the feet which help it from moving across your desk while you use it. – — — >> Please read the more on the MagneTrainer. It can be comfortably operated with or without the special hand attachments which are sold separately. 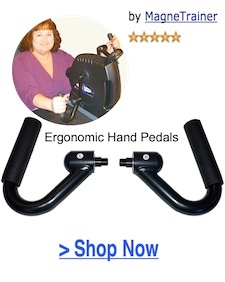 To assist in easily attaching either foot pedals or the hand pedals, you can also get a set of ‘quick connects’ designed specifically for this use. 4. This one is different and although is used as a seated bike, it does not fit under the desk. 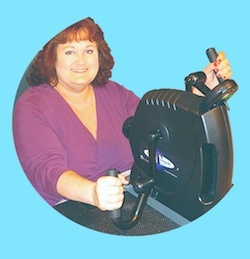 Great for seated exercises< for more than just the office. The machine works upper and lower body by simply swinging the pedals into the position you want them. There is a locking knob to ensure they stay in place. 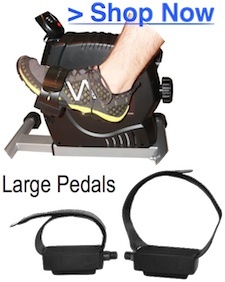 The pedals are non-slip and there is also a tension adjustment to increase or reduce the effort required. It is capable of both forward pedalling and reverse for multiple muscle targeting. Go here for a various Total Body Cycles. 5. This last one is a very lightweight version. 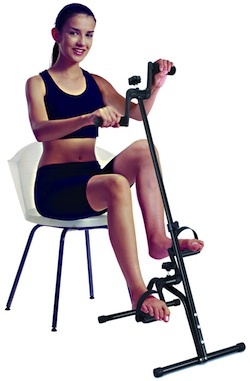 This mini arm and leg exercise bike machine allows you to work your arms and legs at the same time. This is a friction style with a dial tension knob that pushes on the pedal arm to cause resistance. I cannot recommend this for heavy use but if you are just looking for something that will allow you to move your arms and legs while seated, this is a good choice. If you need something more robust it is not recommended to buy this one. There are other total body cycles to choose from on this page. 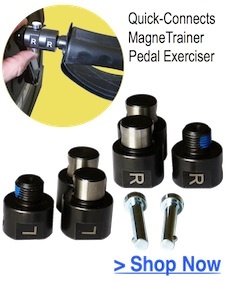 There are also mini pedal exercisers that can be used for either the legs or arms, just not at the same time. 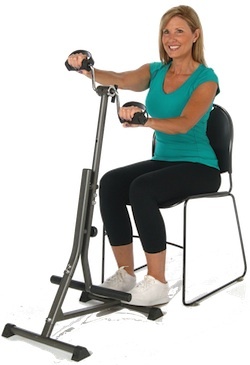 The most popular one we sell is the Stel’Air Deluxe Folding Pedal Exerciser. I’ve had trouble finding a good arm exercise peddler. Do you know if there are any that are total body pedlers? Are these bikes like total body pedals or do you just use them as arm pedal bikes?